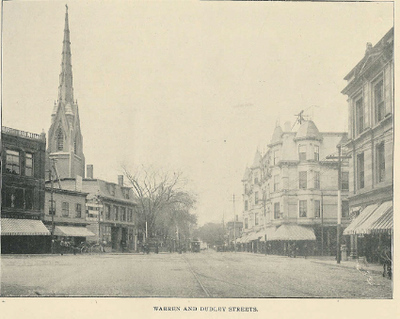 Corner of Warren and Dudley Streets, Roxbury, c. 1895 from Picturesque Boston's Southern Suburbs. Click photo to enlarge. (Image copyright The City Record and Boston News-Letter, all rights reserved). This view of Dudley Square c. 1895 shows the recently renovated Palladio Hall (to the far right), Hotel Dartmouth (center) and the area where the B-2 police station now stands (to the left of Dudley Street). You can read about the history and renovation of the Hotel Dartmouth here, in a blog post from the Affordable Housing Institute. The 2006 Statewide Historic Preservation Conference, "Serving Neighborhoods through Preservation" will be held Wednesday, 20 September 2006 from 8:30 A.M. to 6:00 P.M. at the University of Massachusetts-Boston Campus Center. This looks to be a good one and I'm especially interested in the panel presentation on the work being done in Dudley Square and John Eliot Square in Roxbury. To see Peter Vanderwarker's photos of Dudley Square and the Hotel Dartmouth building in 1988 and 2006 click on the conference link. On a related note, Massachusetts Archaeology Month is October 2006 with dozens of archaeology related events throughout the state. For more information, click here. Link: MHC: Massachusetts Historic Preservation Conference. The envelope has a post mark of Aug 15, 1929. Is there anything left of this business? ?